On The Steep Steps Of Enlightenment? 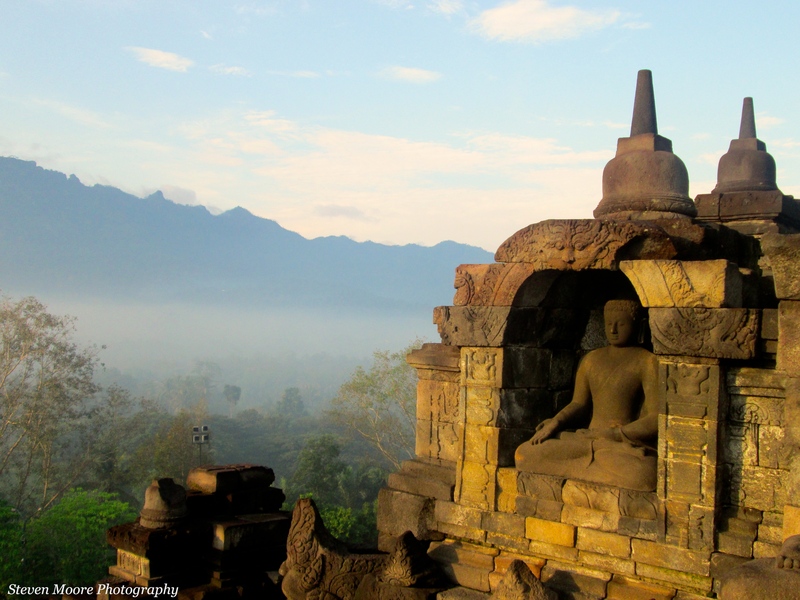 Our main reason for coming west to Java from Bali was my long standing wish to visit Borobudur, Buddhism’s largest temple. My fascination with the world’s religious structures is in stark contrast and at surprising odds with my atheism, and though I don’t adhere or subscribe to any of these institution’s beliefs, traditions and fairytales, I admit I greatly admire the way they build. From the Pyramids at Giza to The Vatican of St. Peter’s to the Golden Temple at Amritsar and the vast temple complex of Angkor; all amaze me with their unique styles and size and beauty. 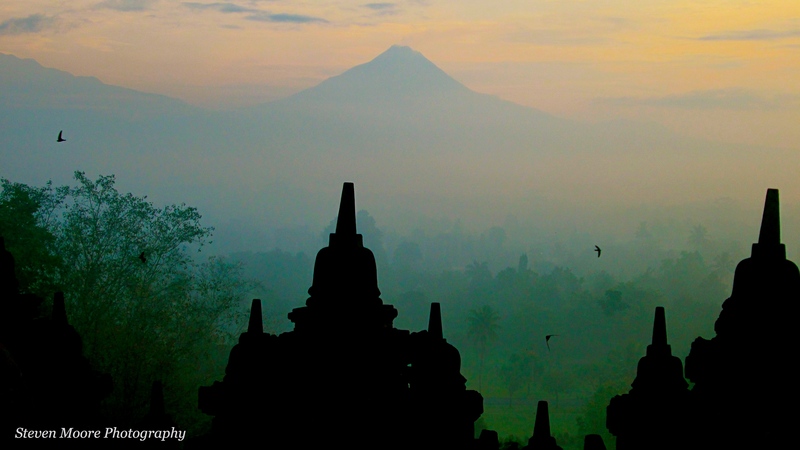 Borobudur was no different. As the early morning sun speared through the surrounding forest, one by one the giant stone stupas appeared through the gloom, silhouetted against first golden then cerulean skies. As we climbed the many, steep steps upwards and through the nine layers of the temple, distant mist clad volcanoes loomed large and broody. And amid such peace and serenity at that early hour, with over 500 passive statues of Buddha looking on, apparently unconcerned by my heathen status, was, shall we say, enlightening. Stone galleries that span the various layers of the vast structure with thousands of intricate and exquisitely carved panels, which if fitted end to end would stretch almost 4 miles, depict such scenes as the the life of Prince Siddhartha and the birth of Buddha, as well as the law of Karma, offer a rarely complete pictorial guide to the history of Buddhism. 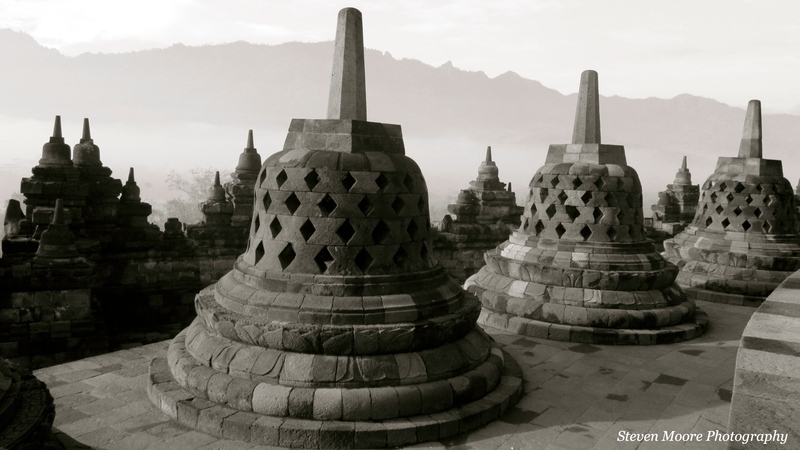 Borobudur was truly spectacular. 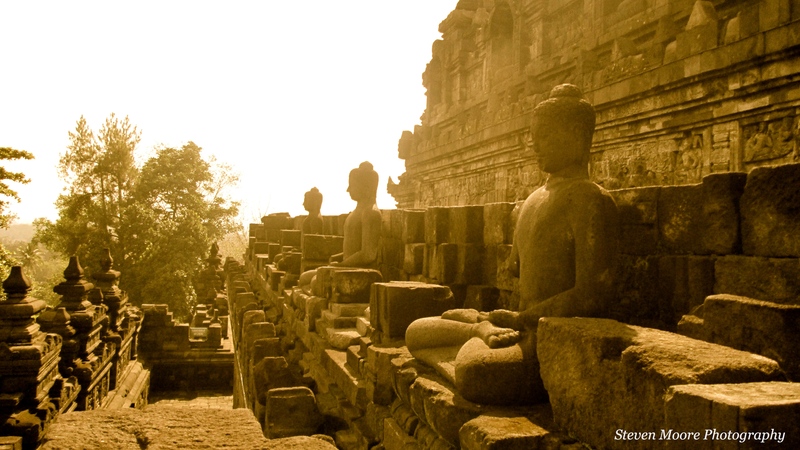 However, no important archaeological site would be complete without it’s swarms of largely uninterested tourists, and in this case it was bus loads of Indonesian school children ferried in from as far away as 300 miles, the main purpose being to practice their English. On us. It was a lot of fun for the first hour, posing for pictures with kids who had apparently never seen anyone with white skin and a long nose before, other than on TV. Leslie was in her element, smiling and waving, playing the movie star for a couple of hours. 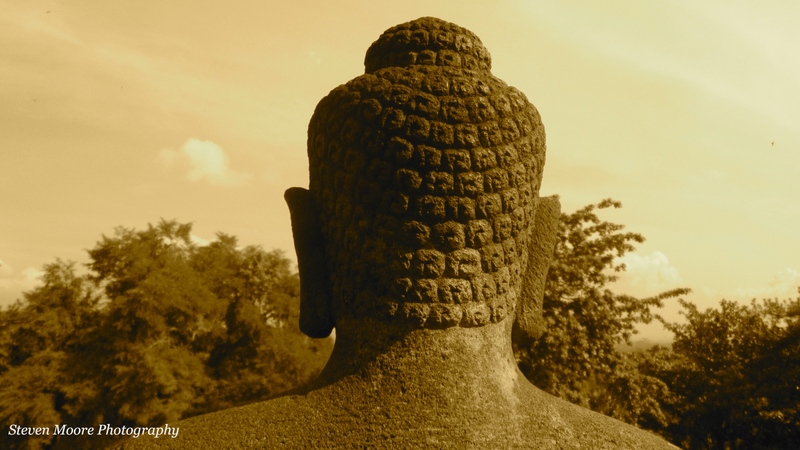 But I was one of the few tourists actually interested in where I was, so I slid away to a more secluded spot for an hour, in order to get my few moments of peace with Lord Buddha. Nice theory. But, with what I’m guessing were roaming herds of more than 500 kids, all eager for a chat with the white skinned, long nosed, aviator wearing dude, my chance at enlightenment would have to wait until another day. Where is your favorite temple, or any building, for that matter? All images by The Nomad, Steven Moore, except the one we’re both in, courtesy of a lovely Indonesian teacher fellow. 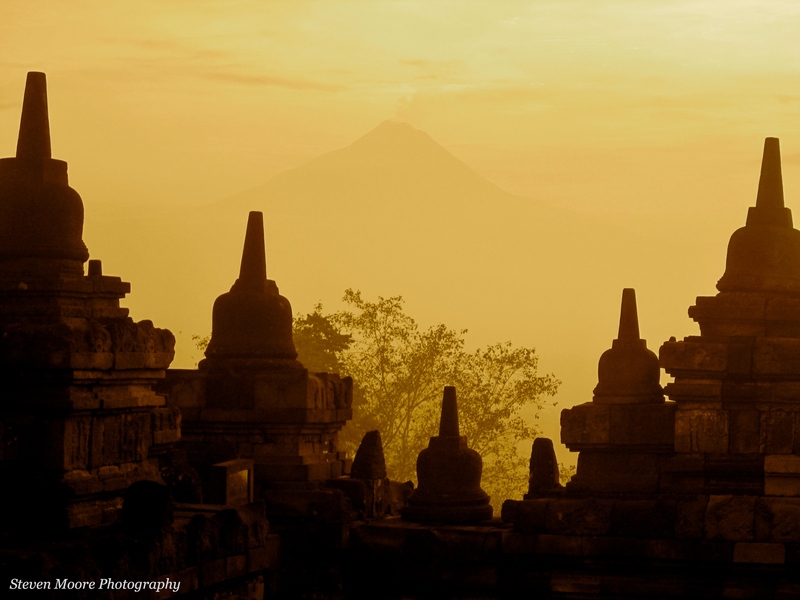 I went to Borobudur about a year ago. Like you, awe-struck by the building process. Thanks for helping me relive the memory. Hey. Thanks for stopping by, and you’re welcome. Yeah, I’m always awed by religious structures, regardless of their meanings, especially as most of them are so old and didn’t have modern technology to aid them. Erich Von Daniken would have us believe aliens were the architects…it was interesting and believable in my 20s. Have you read him? Amazing books and well worth a read, even if some of his ideas are far fetched. Beautiful pictures! I’ll have to add this to my bucket list of places to visit. Thank you. I’m not really much of a photographer, but it just happens that the things I take photos of are beautiful. I am practicing though, and have somehow just had 2 pictures published in Travel + Leisure magazine, accompanying Leslie’s article. No money for me, but would love to sell some sometime. Steve, you really captured the beauty and wonder of Borobudur – at the perfect time of day. I know the first time I saw it I was totally blown away. All of my research hadn’t prepared me for the size and majesty of the place. And on a separate note, I love your new blog theme – Expound. It really showcases your photography and writing. Good choice! Thanks a lot, and thanks for stopping by the blog. Come back soon. Thanks Kalista. A memorable place…sad it’s getting bombarded by the volcano eruption…again.